At present, the chiropractic profession has difficulty being compliant with Medicare documentation requirements. The 2009 report from the Office of the Inspector General reported the following: "Distinct from the undocumented claims, 83 percent of reviewed chiropractic claims failed to meet one or more of the documentation requirements. In January 2011, the California Chiropractic Association reported the following on its Web site:  "Palmetto GBA has released the results of its review of chiropractic Medicare claims and found an "unacceptable" error rate of 68 percent for Northern California and 77 percent for Southern California. These results are very troubling, as Congressional leaders have threatened to remove chiropractic from Medicare if the profession [does] not improve its billing practices." Perhaps two primary issues may be at work. Either an inaccurate message is being delivered to chiropractors regarding appropriate Medicare documentation requirements and/or chiropractors are misinterpreting the message. Let's attempt to clear up some of the confusion, outline documentation requirements based on several Medicare publications, and provide a flow chart for easy visualization of the required process. The rules for Medicare are spelled out in section 240 of chapter 15 of the Medicare Benefit Policy Manual  and in your local carrier's or administrator's Local Coverage Determination (LCD). The terminology is generally consistent; however, it can be confusing based on how the language is misinterpreted by chiropractors and those who teach documentation and coding seminars. Contrary to what many believe, Medicare documentation is not subluxation-based, even though parts of section 240 can mislead one in this direction. Why do we say this? Because "subluxation-based" to chiropractors is a different concept compared to subluxation-based to Medicare, and this fact is clearly spelled out in the rules. Subluxation-based chiropractors view the adjustment of the asymptomatic spine as an acceptable practice. However, this is not the case for Medicare – for Medicare, subluxation is synonymous with a painful neuromusculoskeletal condition of the spine that disables the patient from engaging in routine functional activities of daily living. In the context of treating Medicare patients, consider the following statements from various LCDs throughout the United States. From the Florida LCD: "Chiropractic services involve manual manipulation of the spine by a licensed chiropractor to alleviate painful symptomatology due to subluxation of the spine as demonstrated by x-ray or physical exam." From the LCD for Upstate New York: "Most primary neuromusculoskeletal disorders manifest primarily by a painful response. Standardized measurement scales (e.g., Visual Analogue Scale (VAS), Oswestry Disability Questionnaire, and the Quebec Back Pain Disability Scale) may be used to measure improvement or lack thereof." From the Trailblazer LCD for Colorado, New Mexico, Oklahoma and Texas: "For the purpose of Medicare, subluxation means a motion segment in which alignment, movement integrity and/or physiological function of the spine are altered although contact between joint surfaces remains intact. A subluxation usually falls into one of two categories: . Acute, such as strains and sprains. . Chronic, such as loss of joint mobility." In a senior citizen, an acute strain/sprain or chronic reduction in joint mobility is always painful. This is why the Florida LCD states that manipulation is to "alleviate painful symptomatology." This is also why the Upstate New York LCD requires the use of outcome assessment tools that measure pain and disability. This view is further evidenced by structural and process measures reported through the 2011 CMS Physician Quality Reporting System (PQRS). Two of the three measures that doctors of chiropractic may report are pain assessment and functional outcome assessment. According to PQRS standards, functional outcome deficiencies are defined as "impairment or loss of physical function related to neuromusculoskeletal capacity, including but not limited to restricted flexion, extension and rotation, back pain, neck pain, pain in the joints of the arms and legs, and headaches." In section 240 and all the LCDs, three concepts appear in a fashion that can lead a DC to think they are distinct entities. We read about subluxation, the significant neuromusculoskeletal condition, and the ICD-9 diagnostic code as if they are separate and causally related. In fact, from an operational perspective, each is referring to the exact same entity: a painful spinal condition that is significant enough to create disability and must be documented in the context of the initial and subsequent visits. Please notice that the word subluxation does not appear in the table. This is because Medicare documentation is not about "subluxation" in the context that chiropractors perceive it. Rather, as described above, Medicare operationally defines subluxation as a painful spinal condition that creates disability. The sooner we embrace this fact, the sooner we will move toward compliance and hopefully, reimbursement for our full scope of care. 1. Medicare patient enters office complaining of low back pain that extends into their buttocks. They cite various functional limitations (disabilities) due to their pain. Must establish medical necessity for spinal manipulation. Is the beneficiary experiencing a significant neuromusculoskeletal health problem necessitating manual manipulation by the chiropractor? Based on this presentation, the answer is yes, which permits us to proceed to the history. • Secondary complaints The history demonstrates medical necessity only if the patient is functionally limited, which is almost always due to pain. The chance of a functional limitation without pain is exceedingly rare. Chiropractors should acquire or develop a new patient history form that addresses the history components required by Medicare. It is important to note is that Medicare's history requirements are a basic guideline. A comprehensive history is required due to all the probable red flag and non-red-flag disorders that need to be considered. Proceed with examination only if the history substantiates medical necessity. 8. A significant major artery aneurysm near the proposed manipulation Red flags (RC & AC) can be identified in a new- patient / history form and from an individual red flag form. If absolute contraindication(s) are identified, then consider immediate referral. For relative contraindications, consider a referral and precautions to HVLA thrusts. The patient record must indicate the presence or absence of contraindications. Chiropractors should acquire or create history forms that include screening questions for these contraindications. 4. Physical examination Medicare clearly mandates that the physical exam must demonstrate a causal relationship between the spine and the patient's presenting complaint, which demonstrates medical necessity for spinal manipulation. In addition, the manipulation must have a direct beneficial therapeutic relationship to the patient's condition. The manipulative service must provide reasonable expectation of recovery or improvement of function. 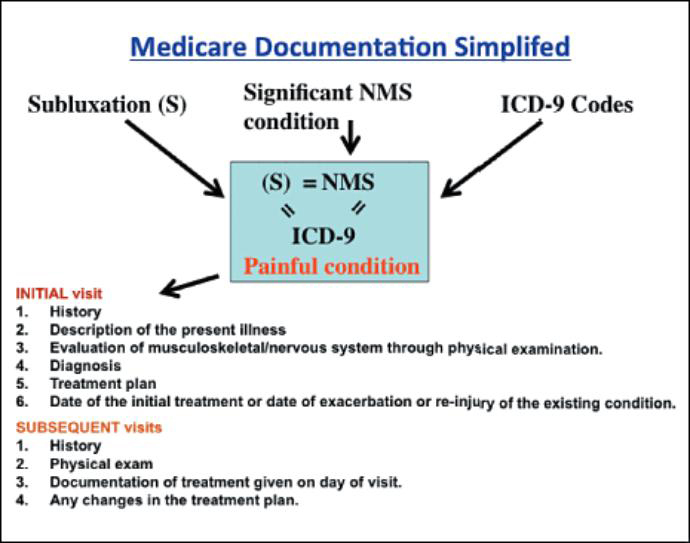 The physical examination leads to the generation of three important documentation requirements: (1) the selection of the vertebral level that is capable of generating the painful symptoms, (2) PART and (3) an appropriate ICD-9 code, all of which establish medical necessity for spinal manipulation. 5. PART The acronym PART has been used to describe the examination components indicating that a patient is suffering from a spinal condition amenable to manipulation. A least 2 of the 4 PART criteria must be met, with at least one of them being the "A" or "R" component. What about radiographs? They are not required to satisfy Medicare documentation requirements. When should radiographs be used? For pathological diagnosis purposes. The designation of PART in the record demonstrates to Medicare that the stated spinal level of dysfunction, as per the listed regional 739 code, has been examined/ identified and correlated to the secondary ICD-9 code. From page 11 of the 2009 OIG report:  "The records would indicate a problem in one area of the spine which was examined, but indicated treatment to three to four areas of the spine and charged according to procedure without correlation to diagnosis." We suggest using/developing examination forms that lead to appropriate documentation of the correlation between PART and the 739 and secondary ICD-9 codes. 6. Generation of a diagnosis and related ICD-9 code With the exception of regular Medicare in Florida, Puerto Rico and the U.S. Virgin Islands, the primary diagnosis for Box 21 of the 1500 billing form will be the 739 code series; one 739 code for each spinal region billed. Each primary 739 code should be followed by a secondary diagnosis, which should reflect the correlated (and correctable) significant neuromusculoskeletal condition that is painful and limiting a patient's function. In Florida, regular Medicare* billed to First Coast Services Options, the 739 code series is not billed as a diagnosis code, but all other examination, treatment, and documentation requirements are identical. (2) the generation of an appropriate secondary diagnosis code. *For long-term goals, write out what the predicted maximum improvement will be for the patient; this will help you identify when the AT modifier is no longer supported and it must be changed to GA for maintenance care. The treatment plan must be outlined in the patient's medical record. This will vary on a case-by-case basis. We suggest using outcome assessment instruments such as the Quad VAS, Oswestry Disability Index, Bournemouth Neck and Back, Pain Disability Questionnaire (PDQ), etc. (Medicare Benefit Policy Manual, Chapter 15, and Section 240.1.5.) A reasonable prognosis can be generated based on the acute / chronic nature of the condition and based on any perpetuating factors such as biopsychosocial issues, lifestyle, nutritional, behavior, health status etc. Factors that influence prognosis should be included in your forms / patient record – they need to be documented. 6. Any changes in treatment plan We suggest developing a form that allows for consistent documentation of each Medicare patient visit so that each required component is satisfied. A SOAP note to include PART is most appropriate. For exacerbations or new complaints, a new initial sequence is warranted, which requires Box 14 to be updated. Office of Inspector General, Dept. of Health Human Services, May 2009. "Palmetto CERT Review Finds ‘Unacceptable' Chiropractic Medicare Denial Rate." Protocols and Algorithms. 4th Edition. Boston: Jones and Bartlett; 2009. A clinical model for the diagnosis and management of patients with cervical spine syndromes. A theoretical model for the development of a diagnosis-based clinical decision rule for the management of patients with spinal pain. Murphy DR, Hurwitz EL, Nelson CF. A diagnosis-based clinical decision rule for spinal pain part 2: review of the literature. Murphy DR, Hurwitz EL, McGovern EE. Outcome of pregnancy-related lumbopelvic pain treated according to a diagnosis-based decision rule: a prospective observational cohort study. A nonsurgical approach to the management of patients with lumbar radiculopathy secondary to herniated disk: a prospective observational cohort study with follow-up. Netter's Orthopedic Clinical Examination: An Evidence-Based Approach. 2nd Edition. Philadelphia: Saunders Elsevier; 2011.